When I’m writing this, I’m working for a non-governmental organization called Lentera Anak Foundation. Just as its name (‘lentera anak’ means ‘children’s lantern’), our work focus on children rights and youth participation. But since 2013, our main focus has been on tobacco control and how children and young people have reciprocal relations with the issue. I started as a volunteer for Lentera Anak in 2015, when the foundation helped me to co-initiate Youth Movement for FCTC with my friends all over Indonesia. We started the movement from a small lunch in a small cafe on April 2015. We set our goal to support Indonesia to sign Framework Convention on Tobacco Control (FCTC) and enforce tobacco control measures to protect its young generation from cigarettes. We were a group of small butterflies against a giant industry who left many of us sick and addicted of its dangerous products. What we did back then was only small flap of wings in the air. We never thought we would grow so large and had huge impacts on national policies, let alone the people around us. We had our moments of discomfort and doubts. But the chairperson of Lentera Anak, Mrs. Lisda Sundari always had faith in us. Mrs. Lisda firmly believes in the power of young people. She said the small flaps of our little wings will be a butterfly effect, that one day will create a hurricane of change for a better world. A few years has passed, and now with our noises turned into voices, we are still paving ways for our butterfly effect. Our movement to protect young people from cigarettes has gained supports from local leaders, mayors, ministers, and even noticed by the president himself. After sharing about our experience in local and national levels, I started to share our experiences in international forums. But never have I imagined myself sharing our experience by attending an event with such abundant network, knowledge, and inspiration like One Young World. 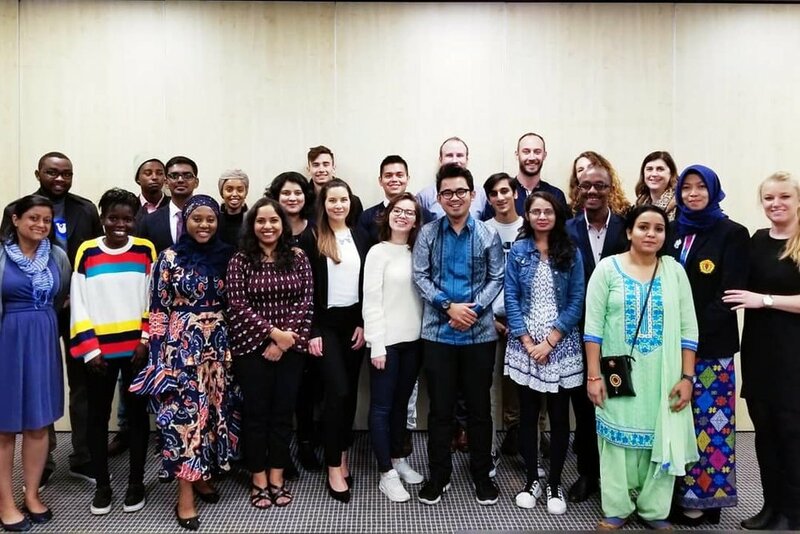 On October 2018, I had the honor and opportunity to attend One Young World in The Hague as a Young Health Programme Scholar, together with Siti Syifa from Gagas Foundation and 16 other scholars from various countries. There were 14 Indonesian delegates in total, and 10 of them departed from Indonesia, just as I did. One Young World was attended by almost 2.000 delegates from the age of 18 until 30 from 193 countries. The speakers varied from CEOs of Multinational Corporations like Paul Polman from Unilever and Rakeesh Kapoor from RB, world leaders like former President of Ireland Mary Robinson and Prime Minister of Netherlands Mark Rutte, NGO leaders like Secretary General of Amnesty International Kumi Naidoo, Nobel laureates like Prof. Muhammad Yunus and Kailash Satyarthi, until activists with disabilities. With big names lining up as its speakers, if I were to describe One Young World, I think the forum feels like a gigantic TED talk, meets United Nations General Assembly. “Young people have the idealism that life will rubs off from you. In your 20s you feel all the injustice. At 35 you are focused on your husband, wives, children. This makes your focus sharpen. You focus more on personal matter rather than collective ones. But this is completely human. Therefore, now while you are still young, it's the right time to make a change." At the global forum, I represented Youth Movement for FCTC and Lentera Anak Foundation to share about tobacco control and meaningful youth participation. I also represented my own organization, Emancipate Indonesia to speak up about modern slavery and promote our slavery-free, fair trade product initiative. But there was something that made my trip to One Young World had a bigger purpose: I had the opportunity to speak on stage, in front of all delegates at the Health Plenary Session. Beyond words. That's how I felt the moment I knew I was going to share my movement’s fight against Big Tobacco on stage at One Young World. With that kind of exposure, I will not only represent the organizations I am working for, but also my country. As the only Indonesian and Asian delegate speaker of the Health Plenary Session, I was determined to give the best representation of how young people struggle for a better health and better development of their communities. Just a month earlier, on September 2018 I was at the 12th Asia-Pacific Conference on Tobacco or Health in Bali as its youngest speaker. I spoke beside two Indonesian minister, a WHO director and advisor, and a senior expert from Vital Strategies. There were 34 countries and almost 1.000 people. I thought that was big enough for me and my movement. But then One Young World came. I gritted my teeth. Speaking up against a Goliath-alike industry who preys on young people is always thrilling. Adrenaline pumps in my veins, every time I realize that my words could turn me into an Icarus who flew too close to the sun. But we are already in it skin deep, and show must go on. I got nerves down my spines. I was nervous not because I’m afraid to look bad, but because I’m afraid I would disappoint the people who worked hard to help me get where I was that day. But with the strength that my friends and colleagues gave me, I gave it all. In my every word, their passion and hope to free Indonesian youth from tobacco were intertwined. One of the highlights from One Young World 2018 was definitely Terry Crews. As a Hollywood actor and activist, Terry shared his fight against toxic masculinity, and how he used his vulnerability to speak truth to power. Everybody applauded his bravery to speak up and shared his personal experience to amplify his message against sexual assault and toxic masculinity. When I knew Terry was going to be the counsellor who will introduce me on stage, I was beyond glad. The man was so humble and heartwarming in person. We talked for a while before going on the stage. Terry felt concerned about youth smokers in Indonesia, and how smoking as a harmful behavior is viewed by majority of Indonesian men as a ‘very male thing to do’ or ‘the thing to do.’ Terry blatantly refuse this concept of toxic masculinity on stage, and I couldn’t be happier to hear it from him. Coming from the man himself, Terry also stated that he's been committed not to take any cigarette, alcohol, or gambling ads---because he doesn't do any of them. I was amazed by how Terry walks his talks, and I just hoped that there would be more public figures in Indonesia who are committed to reject commercial deals with Big Tobacco. Many people see Terry as the funny guy from Brooklyn Nine-Nine, but when I met him, his conviction for doing the right thing is what echoes through me in our small talks before we were going on stage. Being introduced by a man not only measured by his fame, but also by his principles, made me felt so empowered to speak up blatantly against Big Tobacco on stage. After a cool pep talk and introduction from Terry Crews, I shared how my movement struggles in challenging the tobacco industry’s propaganda. Tobacco industries in Indonesia spend a lot of money on ads and promotion that targets young people. They also give scholarships to students and athletes, and even organizes concerts to target young people. Sometimes activism in tobacco control can even be a tough path to take. The issue itself is an elephant in the room that people rarely talk about. Even many Indonesian people still do not believe that tobacco harms our health, or assumed that advocates like myself are foreign agents who are trying to attempt a proxy war. Some One Young World delegates in the audiences laughed in disbelief. Maybe because tobacco is not much of a problem elsewhere. But just because it doesn't happen to you, doesn't mean it doesn't happen. In Indonesia, tobacco industries still thrive with their propaganda, while the age smokers are getting younger, and the number of smokers keeps increasing. Nevertheless, here we are, trying to be David who defeats Goliath with our own ways. 1 time capsule, 1 declaration, 6 puppets, 11.022 letters, 30.000 petitions, 102 communities, and thousands of youth in 31 cities: these are the face of our fight against tobacco industries in Indonesia since 2015. As I have conveyed in my speech before, I believe young people deserve to inherit a healthy world. No one should suffer from lung cancer or heart diseases because of their addiction to cigarettes. Being a Young Health Programme scholar in One Young World has enabled me to share my fight with my movement for a healthy and smoke free Indonesia since 2015. But sharing all of these made me realize something: we are far from finished. We have so much yet to achieve. But one day, David will defeat Goliath. And young people will finally get what they deserve: truth, justice, and well-being for all. My speech in One Young World had created another butterfly effects. Despite some disbelief among the audience, almost all of the responses to my speech were incredibly positive. Many delegates came over to congratulate my speech. Some of them said they are now committed to make their offices smoke free. Some of them shared the same loss as I did, with family members died of cigarettes addiction. Some even said I should go into politics and run for office, an option that never really occurred in my mind. Being in One Young World has made me realize how big our butterfly effect is now. With its gigantic scale of knowledge and networks, One Young World has paved a way for me to connect with many passionate young leaders with ideals and determination. Sometimes I even think without all the big screens and sound systems, One Young World will still be an amazing place to learn what are on the other side of the coins. To see beyond, think beyond, and do beyond, for the world we need and the world we want. After all, young people are the leaders who serve today and tomorrow. Margianta Surahman Juhanda Dinata has been involved in advocating tobacco control with youth across Indonesia for the past few years,. Along with Youth Movement for FCTC and Lentera Anak Foundation, he advocates tobacco control through meaningful youth participation, and seeing the issue from a more comprehensive perspective. Thus on 2015, he co-initiated Youth Movement for FCTC with the help of Lentera Anak Foundation. The movement was intended to support the president to sign Framework Convention on Tobacco Control (FCTC) and enforce any tobacco control measures to protect Indonesian young generation from cigarettes. He also founded Emancipate Indonesia, an organization that fights to end modern slavery. Emancipate Indonesia is one of SDSN Youth member organizations.